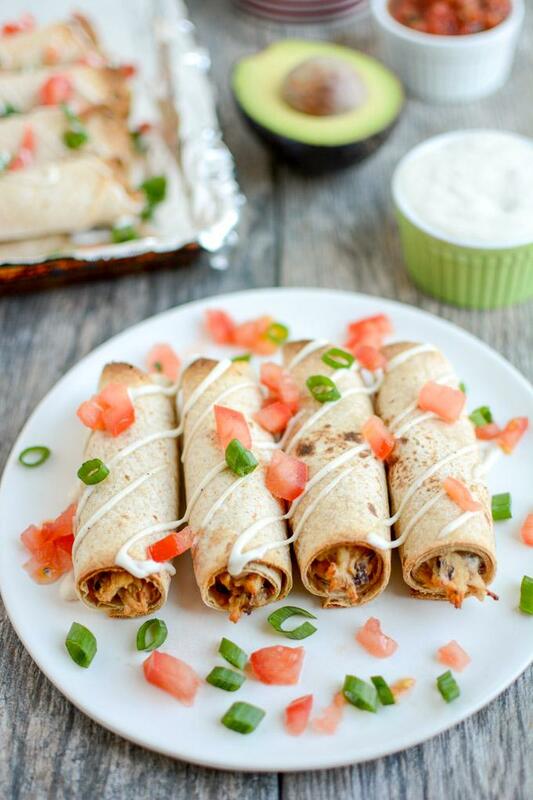 These Baked Ranch Chicken Taquitos are a quick and easy, kid-friendly option for lunch or dinner and a great way to use up leftover chicken. Make a double batch and freeze some for a busy week! 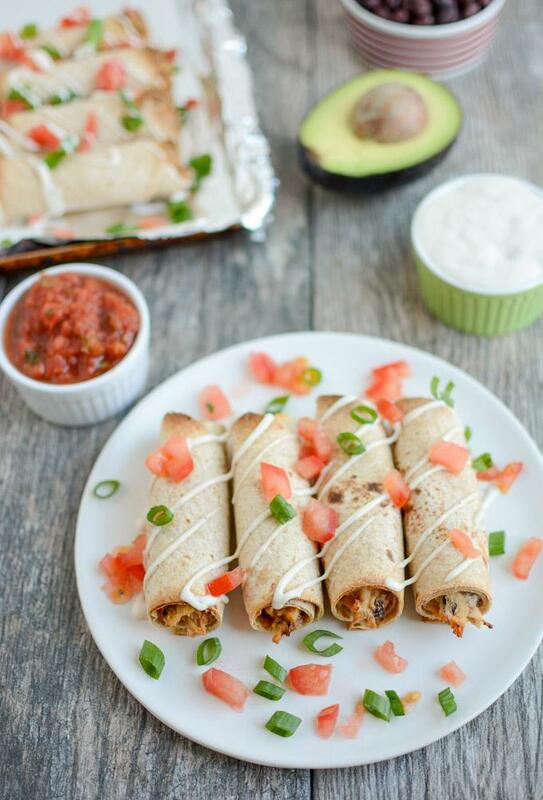 Just popping in to share the recipe for these Baked Ranch Chicken Taquitos that I made yesterday. I took some time away from the kitchen last weekend so yesterday I got back into the swing of things with two new recipes and this was one of them! Here’s the thing about taquitos. They’re like tacos, which my kids love…but they’re rolled up really tightly which makes it easier for me to pack a lot of stuff into them without worrying about them pulling a taco open and inspecting every single thing that’s inside. When Squish eats tacos, it’s chicken and cheese. That’s it. And if he had it his way, it would just be cheese. These taquitos have some black beans and hummus in there, along with shredded chicken, some cheese and a little ranch. I’m not a huge ranch fan and lemme tell you, I LOVED THESE. 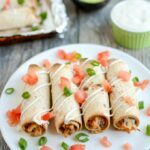 Even more good news about these Baked Ranch Chicken Taquitos – they can be frozen after assembly and then baked straight from frozen. Win, win, win. That means you could easily make a double batch, freeze one and bake the other right away. I served these to Squish for lunch with extra ranch for dipping but if you’re not a ranch fan, you could leave it out and serve with salsa or guac for dipping. They’re the perfect way to transform leftover chicken into a fun, easy meal the whole family will love! In a bowl, mash black beans with a potato masher or fork until paste-like. Add hummus and taco seasoning and mix well. Add chicken, cheese and ranch and stir to combine. Place 2-3 Tbsp of the mixture in each half-tortilla and roll tightly. Place on a baking sheet and bake for 12 minutes. Drizzle with additional ranch if desired, garnish with tomato and green onion, serve with ranch, guac or salsa for dipping. To freeze: Assemble as directed. Freeze on a plate or baking sheet. Wrap in plastic wrap and place in ziploc bag in the freezer. Bake from frozen for 12-14 minutes. If you don’t like Ranch, you can leave it out. You can also add extra cheese or beans if you want and you can leave the beans whole if desired. Simple right? Like I mentioned in the notes, I only mash the beans to make them less noticeable for my kids so feel free to leave them whole if you want! Baked taquitos are my favorite! I used corn tortillas for mine but I like the whole wheat tortillas too! These are fantastic – I often have shredded chicken over, and these are perfect for my ever growing, ever hungry son. He will love them!! !